Theoretical settlement price based on settlement price of 1st contract month of Gold Standard, and using days to expiry and a forward rate. The forward rate itself is calculated based on settlement prices of 1st and 6th contract months. Japan hosts a deep and liquid OTC gold market, and long-standing and liquid exchange trading of gold futures on the Tokyo Commodity Exchange (TOCOM). There are also a large number of precious metals refineries based in Japan, many of which are owned by the same industrial groups that also operate the Japanese gold trading entities involved in banking, brokering and investment activities connected to TOCOM and the wider OTC gold market. To grasp how well-developed Japanese gold market is, its worth reviewing the market’s historical evolution since the 1970s. Prior to 1973, the free import and export of gold into and out of Japan was prohibited. In 1973, in an initiative designed to encourage the beginnings of private gold trading, the Japanese authorities removed the import prohibition on gold. Following this in 1978, Japan lifted its gold export ban. This encouraged Swiss and London gold dealers who were based in Hong Kong to begin consignment gold trading using .9999 gold kilobars which they supplied to the Japanese market from Hong Kong. In 1982, the Japanese government began allowing Japanese commercial banks to market investment bars and coins to their domestic retail customers. The same year, the Tokyo Gold Exchange launched a 1 kilogram gold futures contract. The following year in 1983, a ‘Loco Tokyo’ OTC gold market was established by three domestic entities (Tanaka, Sumitomo, Mitsubishi) in conjunction with London’s N.M. Rothschild (through its Hong Kong branch). These companies acted as market makers quoting gold in lots of 50 kilobars. These developments occurred just prior to the launch of TOCOM. The Tokyo Commodity Exchange (TOCOM) is an electronic commodity derivatives exchange formed in November 1984 through a merger of the Tokyo Gold Exchange, the Tokyo Textile Exchange, and the Tokyo Rubber Exchange. The Tokyo Gold Exchange had itself been founded in February 1982. Today TOCOM trades a variety of commodity contracts, and in addition to gold futures, futures contracts on other precious metals (silver, platinum and palladium) and energy and agricultural products are also listed. TOCOM is also by far Japan’s largest commodities exchange, and in 2013 it traded 27.2 million contracts across its product range, representing a 98.6% share of Japanese commodity exchange trading. The only other commodity exchange in operation in Japan is Osaka Dojima Commodity Exchange, which specialises in agricultural products. TOCOM’s electronic trading hours are extensive, with trading in the day from 9:00am to 3:15pm Japan Standard Time (JST), and also a further trading session from 4:30pm through to 4:00am which includes ‘Night Trading’. These extensive trading hours align well with the CME Group’s near continuous Comex trading, while the TOCOM night trading session also covers the times of the AM and PM auctions of the daily LBMA Gold Price. Tokyo is only one hour ahead of Shanghai, which means that most of the trading hours on the Shanghai Gold Exchange and Shanghai Futures Exchange are aligned with TOCOM’s trading hours. The ‘Standard’ gold contract is a Yen physically deliverable 1 kg contract for 9999 fine gold. TOCOM inherited this contract from the Tokyo Gold Exchange when TOCOM was founded in 1984. The contract was originally listed on 23 March 1982. The TOCOM Gold Mini contract, launched on 17 July 2007, is a Yen denominated cash-settled 100g contract for 9999 fine gold. The TOCOM ‘Gold Rolling Spot’ gold futures contract, launched on 7 May 2015, is a Yen denominated cash-settled contract. At launch, this contract was named ‘Gold Daily’, but TOCOM renamed the contract as ‘ Gold Rolling Spot’ in February 2016. TOCOM also offers a gold options contract on the 1kg futures contract. This option product was launched in May 2004 but has not had any trading volume since 2007. 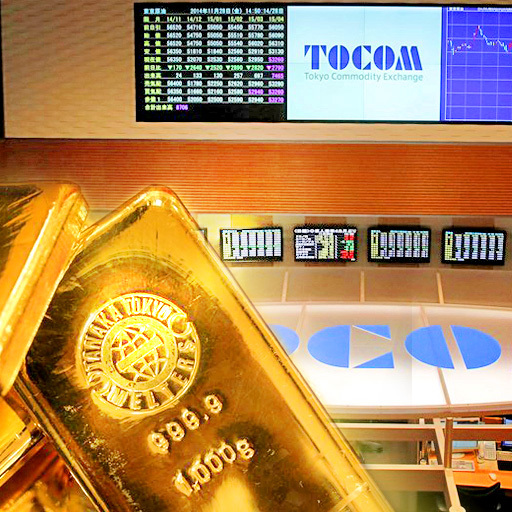 TOCOM claims to be East Asia’s most liquid gold market. The Exchange’s Standard 1kg gold futures contract is well-known internationally and TOCOM price data is sometimes included in gold price discovery analysis along with the price data of the larger London and New York gold markets. However, annual trading volumes in the TOCOM Standard gold futures contract have been in decline for nearly all of the 2000s, for example, from an annual traded volume of 26.6 million contracts in 2003, gold futures trading volume fell to 12.2 million contracts in 2010, and fell even further to 8.7 million contracts in 2014 (approximately 8,700 tonnes). The Gold Mini contract recorded annual trading volume of over 5 million contracts in 2008 and 2009, but by 2014, comparative contract volume only reached 1.4 million contracts. Since trading in the Gold Rolling Spot futures contract only began in May 2015, there are few comparative trading statistics, but the monthly trading volumes have registered between approximately 200,000 and 300,000 contracts per month since launch. TOCOM broker members that trade precious metals include Credit Suisse Securities Japan, Newedge Japan, Evolution Japan, Hoxshin Bussan Co, and Phillip Securities Japan. Trade and affiliate members include Barclays Securities Japan, Sumitomo, ICBC Standard Bank, Goldman Sachs Japan, Mitsui, Mitsubishi, Nissan Century Securities, and Kanetsu Shoji. Trading statistics for the Standard gold contract reveal that 15% of traders are classified as commercials, 41% proprietary, 24% retail, and 20% other, and this contract receives substantial international interest. TOCOM’s extended trading (4:30pm to 4:00am Tokyo time) was added primarily so as to attract international traders so as to compete with exchanges such as CME’s COMEX. In the Gold Mini contract, the corresponding participant profile figures are 0% commercials, 33% proprietary, 46% retail, and 21% other. Not surprisingly, the Mini contract is not of interest to commercials but has a high proportion of retail traders. Nine of these 14 refineries are on the LBMA Good Delivery List for gold. See Japanese Gold Refineries section below. In May 2015, TOCOM and the London Bullion Market Association announced that they had reached an agreement whereby, going forward, TOCOM would license the LBMA’s Good Delivery List as part of its accreditation process for approving bar brands for acceptance in TOCOM trading . Similar to CME’s COMEX report of ‘registered’ gold inventory held in approved warehouses, TOCOM also publishes data showing the amount of gold held in its approved warehouses that is represented by outstanding warehouse receipts. However, the amount of gold held as warehouse receipts (registered gold) in TOCOM approved warehouses for the 1kg gold futures contract is relatively small, at about 4 tonnes. TOCOM has confirmed to BullionStar that it does not provide information on an ‘eligible gold’ category or similar in its approved warehouses in the same way that COMEX does. Therefore, there is no visibility into what other gold these warehouses are holding apart from the gold that is represented by the warehouse receipts. TOCOM also went on record in 2014 stating that is was examining the potential of creating a benchmark price for gold (and for silver) during Asian trading hours, however, such a product/benchmark has not yet been launched[TOCOM presentation to LBMA conference in Singapore, 2014 http://www.lbma.org.uk/assets/events/Singapore%20F/LBMABMF2014_S5_04Seki_en.pdf]. A Japanese commodities exchange named Central Japan Commodity Exchange (C-Com), based in Nagoya, had previously listed a Japanese Yen-denominated 500g deliverable gold futures contract. However, the C-Com exchange was wound down in 2010 and closed in January 2011 due to a slump in exchange revenues. The remaining 4 Japanese gold refinery brands not represented on the LBMA Good Delivery List but that are part of the TOCOM accredited list are Dowa Metals & Mining , Furukawa Metals & Resources, Chugai Mining Pan Pacific Copper. Nikko Smelting & Refining, on the TOCOM list, is part of JX Nippon Mining & Metals. Bars of the Japan Mint and Nihon Material, although on the LBMA list, are not listed by TOCOM. Of the Good Delivery List members, Tanaka Kikinzoku Kogyo and Asahi are also Ordinary members of the LBMA, while Sumitomo Metal Mining and Mitsubishi Materials Corp are LBMA Associates. Note that another subsidiary of Sumitomo, London-based Sumitomo Corp Europe, is also an Ordinary member of the LBMA in the dealer category, and trades precious metals from London[Sumitomo Corp Europe http://www.sumitomocorpeurope.com/Our-Business/Mineral-Resources-Energy/Subsidiaries/index.php]. Mitsubishi also operates a subsidiary, Mitsubishi Corporation International (Europe) Plc, which is an ordinary LBMA dealer member, and trades precious metals out of London . Note that Mitsui & Co Precious Metals Inc, which operated out of London and New York trading precious metals, has now withdrawn from the London and New York precious metals markets, since it made a decision to scale back its international commodity operations. The large conglomerate trading houses / banks are very involved in the Japanese gold market. These houses include Mitsui, Mitsubishi and Sumitomo. Taken as a unit, companies across these zaibatsu have interests in gold refining, precious metals trading and importing, TOCOM trading, gold warehousing, gold ETF products, and offering gold accumulation plans. Taking Mitsubishi as an example, Mitsubishi Logistics Corporation Tokyo Branch, Saga-cho is one of TOCOM’s 8 designated warehouses for the storage of precious metals[fn Mitsubishi Logistics storage facilities in Tokyo. Its refinery business, Mitsubishi Materials Corp’s (MMC), operates a smelter & refinery in Naoshima producing gold output from the recycling of scrap electronics. MMC produces a range of 9999 fine gold bars in weights from 1kg down to 5 grams. It also has a gold accumulation product called “My Gold Partner” (which also offers investment into silver and platinum). An MMC website called ‘Gold Park’ acts as a portal for some of Mitsubishi’s end-user gold products and services. Mitsubishi operates 5 gold retail outlets in various Japanese cities including Tokyo. International gold coins sold by MMC include the Austrian Philharmonic, the Canadian Maple Leaf and the Australian Kangaroo. Mitsubishi UFJ also runs a gold ETF (see ETF gold section below). Tanaka is another example of a company fully integrated into many parts of the Japanese gold market. The Tanaka Kikinzoku Kogyo group runs probably the best known gold refinery in Japan, and Tanaka is also one of the five members of the prestigious LBMA good delivery panel referee, along with 3 of the Swiss refineries, and South Africa’s Rand Refinery. On a proprietary basis, Tanaka trades large gold bars, kilobars and gold grain, and can facilitate gold leasing and gold swaps. Tanaka also runs its own high-end retail network of gold jewellery and investment bar stores in Japan, and is Japan’s largest bullion retailer. Live retail gold quotes from Tanaka are avilable on the company’s website. There is a very developed gold recycling sector in Japan, due to the large amount of high value industrial gold scrap held within electrics and electronics. The sophistication of gold recycling in Japan is partly due to environmental laws which promote this activity. Many of the gold refineries listed above are involved in gold recycling and in gold OTC trading, and some of these refineries produce a range of sizes of gold bars (from 400oz down), both for industrial and jewellery fabrication usage, and for investment purposes. Following the liberalisation of the Japanese gold trade in the 1970s, Japan became one of the world’s largest importers of gold during the 1980s and 1990s fueled by an investment boom in gold as well as the liberalisation boost to the gold trade. In many of those years, annual gold imports totalled over 200 tonnes per year, and in some cases over 300 tonnes per year. From 1980-1991, over 2,700 tonnes of gold imported into the country, much of it in the form of 99.99 kilobars. In 1986, over 600 tonnes of gold was imported into Japan, mostly from Switzerland, the US, and the UK. Of this total, 200 tonnes was used to produce gold commemorative 10 million gold coins (20 grams of gold each) for the 60th anniversary of Emperor Hirohito. In 1990, when Japan imported 300 tonnes of gold, another 2 million gold coins were also produced to commemorate the enthronement of the new Emperor. Gold Accumulation plans, run by the Japanese banks, have also been popular with the Japanese public since the 1990s. All of the above has created a very large stock of investment gold in Japan. Depending on the gold price cycle, some of this gold is dis-hoarded at various times, and comes back into the bank and jewellery company networks. Although the Japanese economy only has a tiny gold mining industry, Japan has in the recent past acted as a source for gold exports, due to the large amount of gold stocks that reside within the country. For example, the World Gold Council has said that from 2006 to 2012, over 260 tonnes of gold flowed out of Japan, with the outflow trend only reversing in 2013. This reverse flow of gold out of Japan was only possible due to the large amounts of gold held within the boarders of Japan. Conversely, when domestic production of gold (from recycling etc.) doesn’t cover domestic demand, Japan imports gold. Japanese demand for gold jewellery and investment gold bars and coins totalled 32.8 tonnes in 2015, comprising 16.2 tonnes of investment gold bar and coin demand, and 16.6 tonnes of gold jewellery demand. One unique bar product in Japan is the “Senryo-bako” (wooden container), where gold bars are sold in a traditionally inspired wooden box. Some example of modern-day Senryo-bakos can accommodate 10 kilobars. Japan Gold Metal Association (in Japanese 一般社団法人 日本金地金流通協会 or The Japan Gold bullion distribution Association), established in December 1979, is an industry body which represents member companies involved in the production, analysis, distribution, and consumption of gold bullion in Japan. Like many similar trade associations, the association publishes educational material on the gold market, also organises training for staff of member companies. ‘Full members’ include many of the gold refinerys listed above such as Tanaka Kikinzoku, Matsuda Sangyo, Ishifuku, and Tokuriki. ‘Supporting members’ are drawn from the mining sector (Sumitomo Metal Mining Co, Mitsubishi Materials Corp, Pan Pacific Copper Co, Japan Mining Industry Association (JMIA) etc) and the metals trading sector (Mitsui & Co, Sumisho Materials Corp etc) There is also a ‘special member’ category, of which the World Gold Council is the only member. Officers of the association are mostly executives representatives from member companies. The Japan Precious Metals Co-Operative Society, originally established in 1938 as the ‘Tokyo Precious Metal Refining Industry Union’, is, as the names suggests, more of a co-operative grouping than the Japan Gold Metal Association. As well as research and education on the precious metals market, the members co-operate in processing and transacting in bullion, purchasing refinery supplies, and members can even avail of borrowing from the society. Members include refiner and bullion dealer, Ando Precious Metal Refining Co, and gold product and bullion dealer Katagiri Precious Metal Industry Co (Katagiri Kikinzoku Kougyou) http://www.katagiri-k-k.co.jp]. The Japan Jewellery Association (JJA), established in 1988, is a government supported trade body which facilitates the development of the Japanese jewellery industry both in Japan and abroad. The association has over 800 members, including the Japan Gold Metal Association, and was established in 1988 by the Japanese Ministry of International Trade and Industry. A lot of the gold refiners and smelters are also members of the Japan Mining Industry Association (JMIA), which is an industry body represneting mining and smetling/refining companies operating in the non-ferrous mining and smelting companies producing non-ferrous metals sector in Japan – gold, silver, as well as base metals nickel, copper, zinc and lead. A list of this assoction’s members can be seen on its website. ETF Securities’ Physical Gold ETF is listed on the Tokyo Stock Exchange, Listed August 2009. Gold Accumulation Plans (GAPs) have been popular in Japan since the 1980s and at their peak accounted for 300 tonnes of gold holdings. In a GAP, an account holder makes regular small purchases of gold via their bank account. In a similar approach to dollar-cost-averaging in the stock market, GAPs build up a gold balance via regular withdrawals from the bank account. GAP holders can withdraw part of or entire gold balance in the form of bullion, coins or jewellery. Tanaka was the first provider to launch a gold accumulation plan in 1980 with the support of the World Gold Council. Other big banks and trading houses such as Mitsubishi, Mitsui and Sumitomo also offer GAP products although Tanaka is said to have approximately 80% of the market. Japan is a prime example of a sophisticated, liberalised, and mature gold market. It supports a liquid and extensive OTC gold market of traders connected to the mining, recycling and smelting industries as well as to the banking sector. Its major futures exchange hosts active and varied gold futures trading, aiding hedging, speculation and price discovery. It has had the distinction of being the largest gold importer on the planet for an extensive period, followed by becoming a net exporter of gold due to the deep reservoir of gold held within the nation’s boarders. Retail investment gold is readily available in many outlets in Japan and the Japanese are sophisticated enough to use physical gold as a store of value and currency hedge, while also tapping into gold banking products and accumulation plans. Being located next door to China, and not too far from the gold market of Hong Kong, it is sometimes easy to forget that the Japanese gold market is still large, still very active, and is undoubtedly of interest to the Chinese authorities as a case study as they continue to liberalise and extent their own domestic gold market.